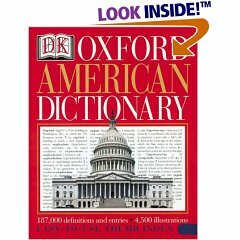 I've been a fan of the DK Oxford Illustrated American Dictionary (see below) for a few years now. The DK Ultimate Visual Dictionary is the next step. It is not a dictionary in which the words are organized with pictures in alphabetical order. However, you can look up the words and find the corresponding page numbers, so finding words is relatively easy. This is a book in which 14 sections explain everything from The Universe to Calligraphy. This book doesn't include individual sentences using the words. "It shows you what each word means!" There are detailed illustrations and gorgeous photographs in rich color. Annotations surround the pictures. In the introduction, they explain how if you wanted to know what the bone at the end of your little finger was called, a normal dictionary would leave you still wondering. With this dictionary, all you have to do is look up "hand" and you find your way to page 211. This is the section on the human body. Turn a few pages and you start to see amazingly detailed information. By page 230, you will see the hand in full detail and find a picture with the annotation reading: "Distal phalanx." The "Visual Dictionary" gives you access to thousands of words used by architects, musicians, doctors, scientists, sportspeople, astronomers and mechanics. The Universe - This book explains why the Milky Way appears brighter in the southern sky than in the northern sky. There are pictures of everything from the solar system to the individual planets, stars and black holes. Prehistoric Earth - Kids will love the pictures of the dinosaurs and the constant movement of the earth's crustal plates shows how the continents have moved across the earth's surface. Plants - This book contains perhaps the most interesting explanation of photosynthesis and pollination I've seen yet. Kids will enjoy reading about the Venus Flytrap or how a seed germinates. Animals -The skeletal structures and internal organs (mostly drawings) of a wide variety of animals are all shown in pictures. I loved the part where they show the hatching of a quail's egg. The rabbits and rodents section will be of interest to anyone who has these cute animals as pets. The Human Body - If you want to know where the organs in your body are located or are even just trying to name various parts of a body, this section is essential for writing, research and home study projects. You can grab this book and see what an instructor is talking about when she says "deltoid" or "external oblique." The section on the development of jaw and teeth was very helpful in understanding how you eventually get your set of 32 permanent teeth. You see it all in a series of pictures. The Development of a baby will fascinate children. Geology, Geography, and Meteorology - There is a section devoted to minerals. Kids will also enjoy the section on volcanoes and fossils. I always wondered how caves form. Physics and Chemistry - A full periodic table and visual explanation of chemical reactions, light, electricity, atoms and force and motion are given here. Rail and Road -A Volkswagen Beetle is disassembled, modern engines are shown in sectioned view and the mechanical components of a typical car are shown with all the parts spread out across the page. The section on "Bicycle Anatomy" will be of use to anyone who loves to ride and fix their own bikes. Sea and Air - Everything from Viking Ships to the anatomy of an iron ship, jet engines and helicopters. The Visual Arts - Finally an explanation on how mosaics are created. The budding artist will also enjoy the section on painting. Architecture - I was fascinated by the Medieval castles and churches. Someone spent a lot of time tracking down the models for buildings from Ancient Rome to modern times. What a collection! Music - Trying to learn how to read notes or interested in the names of all the instruments in an orchestra? They even take a guitar apart and sow you a variety of acoustic guitars. Sports - An extremely detailed section on every main sport you can think of. The playing field, rules, equipment, everything is shown. They even have pictures of each type of swimming stroke. I'm impressed! The authors thought of everything. The Modern World -Ever wonder what the internal components of your Cell phone, PDA, or even vacuum cleaner looks like? 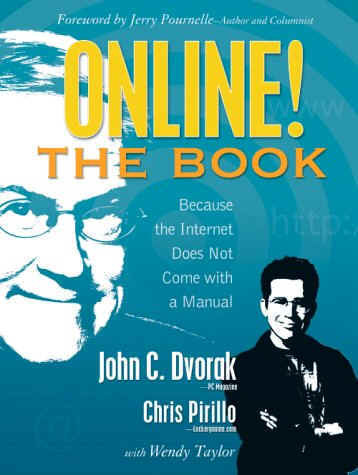 The section describing the Internet was in itself worth the price of this book. Information on cloning technology, political maps of the world, time zones and metric-imperial conversions makes this very useful. Each sections starts with a table of contents and then every entry has introductions that explain the purpose of the illustrations and annotations. Since I am presently reading a book about health and the function of our cells, page 216-217 was very helpful. I first looked up "Mitochondrion" and was sent to page 217 and 239. There before my eyes was a cell in full detail. There is also a series of microscopic pictures of a wide variety of cells on the right hand side. The actual cell takes up most of the two pages. 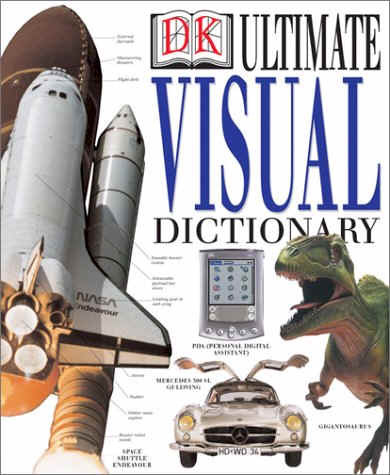 In fact, this dictionary has more than 31,500 terms and 6,000 color photographs and illustrations. This is the dictionary I would have loved to have had as a teenager. It would have made all my classes at school much more interesting. Highly recommended for teachers, libraries and families with inquiring minds. One of the most useful and beautiful books I've ever read. Put a copy on your coffee table and enter the world of knowledge once a day. Soon, the world will just be far more interesting. You will feel that X-ray vision when you look at normal objects in your home and environment. I used this dictionary to look up a word on about the third day I owned it. I was delightfully surprised to find pictures! There are over 4,500 color images to give instant visual definitions and they help to bring unfamiliar items to life and they add a deeper understanding of the words. 600 illustrated feature panels also provide in-depth information on topics such as: technology, natural history, art and music. There are also hundreds of new words and phrases from voice mail to sport utility vehicle which gives an up-to-date appeal to this book. This might just be the most authoritative and accessible illustrated dictionary of American English available today. With 187,000 definitions and entries and an easy-to-use thumb index...it is the only dictionary I will be using at home when I don't want to go look up a word online. This work represents the collaboration between DK and Oxford. Oxford has published dictionaries for over 150 years. DK is well known for their visually stunning books. The pictures really help to give your eyes a break from an overwhelming number of words and definitions. I especially liked the picture of the ocelot on page 565. On page 132 they have listed many of the main cat breeds with pictures. Condescend: Behave as if one is on equal terms with (an inferior), while maintaining an attitude of superiority. or Condescending: Patronizing. The Reference Section includes a Political Map of the World, A Physical map of the World, Countries of the World and their flags, The Night Sky, Measurements, the Periodic Table, Time Periods, Wedding Anniversaries, Birthstones, Time Zones, States of the US, Presidents of the US, Books of the Bible, The Living World (classification system), The Animal Kingdom (classification of the animal kingdom) and a section on Grammar and Style.